My research turned up two individuals named Robert Lee DuVall in Prince George’s and Anne Arundel counties, both descendants of the same Anne Arundel County family founded by immigrant Huguenot Mareen Duvall. Mareen DuVal or DuVall (b. 1625) arrived in Anne Arundel County in 1650. When he died in 1694, he left a vast estate of land and slaves, and 12 children by three wives. The Society of Mareen Duvall Descendants erected several historical markers in the area, including one near Davidsonville at the site of Middle Plantation, where he died. From Mareen Duvall’s 12 children sprung a huge clan whose members intermarried with many important Maryland and Virginia families. Robert E. Lee DuVall was born about 1869 to wealthy plantation-owner and Confederate officer Ferdinand DuVall and Annie Linthicum Duvall. They lost their estate, centered in what is now Crofton, Anne Arundel County, after Ferdinand DuVall’s death in 1878; Robert, his mother and sister emigrated to Oregon, but he returned briefly, in 1900, to reclaim the family cemetery. Robert, a railroad employee, died in Shoshone County, Idaho in 1943. But the youth in this photograph seems a bit too young to have been born in 1869. A second Robert Lee Duvall, born 1875, seems a much better match.This Lee Duvall was the son of merchant Evans Duvall (1839-1911). In 1900 the family lived in Laurel, Prince George’s County. Lee’s uniform is almost identical to that worn by the cadets of Maryland Agricultural College, precursor to the University of Maryland, College Park, just 13 miles away from Laurel. The college’s 1911 historical pamphlet lists all the graduates of the school from its opening to date. Lee is not listed, but he may either have taken the preparatory course, or attended without graduating. He is buried in St. Stephen’s Episcopal Church Cemetery, Crownsville, Maryland, along with is wife, Mary (Moss) Duvall, and children Mary Duvall Waterman, Hilda Adaline Duvall, and Charles Evans Duvall. The Russell studio was operated by William C. Russell (1843-1900), and by his wife, Mrs. Dora C. (Jose) Russell ca. 1886-1904. 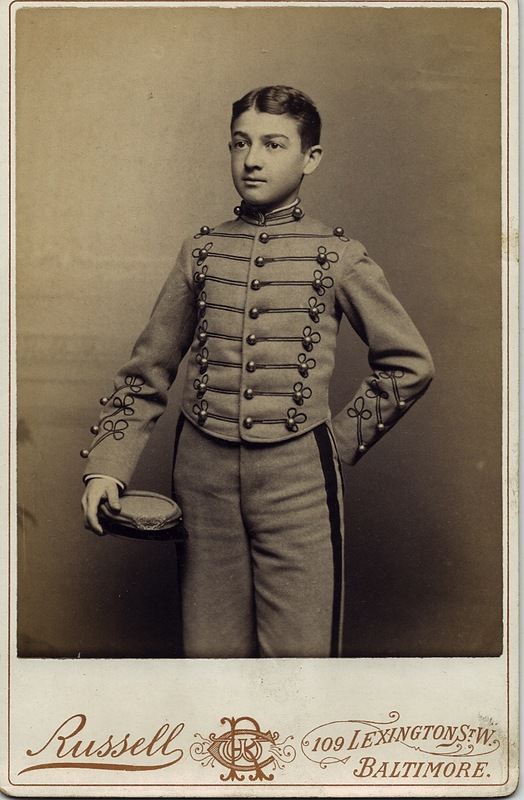 The photographer chose a simple, soft, neutral background, lit from above left, to allow the ornamental pattern of the trim on the youth’s uniform, bright with brass buttons, to shine. For more about Ferdinand Duvall’s career in the Confederate Army, visit his page on this site devoted to the history of the Second Maryland Infantry, CSA. For more about Mareen Duvall and his descendants, see The Founders of Anne Arundel and Howard Counties by J. D. Warfield, published 1905; and yes, Mareen “the Emigrant,” as he is called, has a page on Wikipedia.